- A first-rate historian: Benson Bobrick is the author of several celebrated books, including The Fated Sky and Testament . His work has been hailed as "Lucid and vivid" by The New Yorker, "elegant" by The Washington Post Book World, and "engrossing...detailed and gripping" by the Chicago Tribune . And The New York Times Book Review says, "Bobrick is perhaps the most interesting historian writing in America today.." - A fascinating biography of an underappreciated American hero: George H. Thomas was, Bobrick argues, the greatest general of the Civil War. 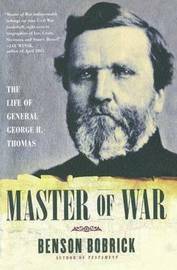 Known as the Rock of Chickamauga, Thomas was regarded by his contemporaries as the equal of Grant and Sherman. In the entire Civil War, he never lost a battle or a movement, and he was the only Union commander to destroy two Confederate armies in the field. But Thomas never wrote a memoir and history neglected him. Until now. . - Powerfully told and grippingly rendered: With his characteristic flair for drama and fast-paced writing, Bobrick takes readers onto the battlefields, into the smoke of gunpowder and the stench of bodies. From the parade grounds of West Point to the bloody Battle of Chattanooga, Bobrick masterfully renders every detail, right down to the buckles on Thomas's boots and the courage in his heart. Backed by scholarly research, this informed and vivid biography at last brings Thomas's tale to readers everywhere..